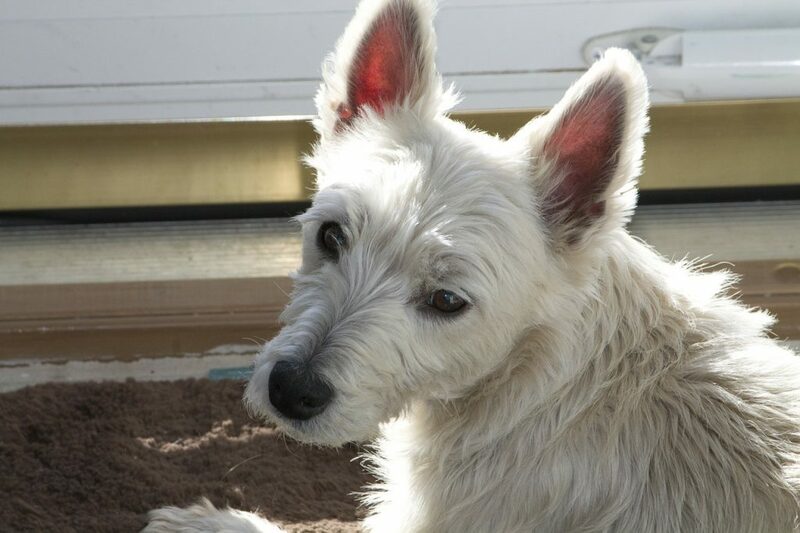 West Highland White Terriers are excellent pets. However, when you get them as a puppy they, like all puppies, come with certain training needs. All puppies bite and Westie puppies are no different. This article will not only teach you how to differentiate Westie puppy biting from simple puppy mouthing, but will also teach you how to properly train your puppy out of its biting habits. Because puppies do not have hands, they reach out using their mouths. They use their mouths to grab things and move them around. “Mouthing” is when they use their mouths to investigate or play with other animals. It is not the same thing as biting. Just like human children, puppies are very curious. They want to check out everything around them and learn more about their world. Also like children, puppies have very bad coordination. While their intentions be innocent, they may accidentally bite your hand while mouthing you. This doesn’t stop it from hurting, but all puppies practice this behavior. There is no malice behind their actions, and they don’t mean to hurt you. Dogs will bite for several different reasons. It is important for you to recognize those situations and try to prevent them. Your westie puppy might not recognize your intentions when you’re playing. If you tug on their ears, take their food, or blow in their face, they might assume you’re trying to hurt them. This may cause them to bite you. Biting is very different from simply mouthing or chewing something. While chewing or mouthing is just their way to check something out, biting is an act of self defense or aggression. Playing too roughly with your puppy may cause them to become threatened. Once they’re riled up or angry, they might bite you. Avoid scaring your puppy, and don’t play rough with them. It is important to recognize aggression in your own behavior and those around you. When westie puppies grow up with their littermates, they learn something called “bite inhibition”. Bite inhibition is when they roughhouse with their siblings and learn how to bite without hurting their siblings. If puppies are taken from their siblings before they can learn this skill, it is up to their owners to teach them. Even if you have an older puppy, it might still be necessary to teach them proper bite inhibition. Teaching them this can take time and dedication, but in the end you will have a westie puppy that will be bite-free. The best way to get your westie puppy to stop biting is to train them or hire a professional to train them for you. Training them yourself is preferrable. No-one knows your puppy better than you, and training them yourself can improve your bond. There are several ways to train your puppy. Picking which one is the best for you and your Westie puppy is important. Using several different options is also very helpful, as long as they do not clash with one another. Hiring a professional is a good choice for those who won’t have the time to personally train their Westie. It is better to have a trained puppy than one who bites guests. If you’d like to enjoy the company of your dog without fear, hiring a trainer can be your best option. Professional trainers do exist, and they can be a great resource for you and your dog. A good training method is yelping whenever your puppy bites you. So, whenever your puppy bites you, yelp loudly and say “Ow!” After voicing your displeasure, turn away and ignore them for a time. This teaches them the aforementioned “bite inhibition.” Doing this teaches them the difference between biting and mouthing. There is no need to hit or yell at your puppy — ignoring them has the same effect. Puppies crave attention, and ignoring them will upset them just as much as a smack. Using dog toys will help your puppy differentiate between what they can bite and what they can’t. They will still bite at your hands on accident just due to poor coordination. In those circumstances, yelp at them and then ignore them. You can also use toys to train puppies to stop chewing on your personal items. If you catch your puppy chewing on something unallowed, swap it out for one of their toys instead. When they do chew their toys, use positive reinforcement and encouragement. Tell them they’re being good and petting them, or even giving them a treat. Using toys instead of your hands will teach the puppy what is acceptable to chew on and what is not. By yelping when they bite, you will teach them to stop when they hurt you. If you’re puppy is playing too rough, it may be a sign that they’re not getting enough exercise. Puppies need a lot of activity and attention before they can settle down and stop playing. Give your puppy plenty of time outside, and make sure they have toys and food to preoccupy themselves. Terriers are extremely energetic, so don’t let them get too pent-up! If you can, try to adopt Westies in pairs. Having a friend will give them an outlet for their energy. The longer you wait, the harder it will be to train your puppy proper mouthing behavior. While your puppies teeth might be painful, waiting until they’re a grown adult will be much worse. Puppies don’t know their own strength, and bigger puppies will cause a lot more damage than an infant. As your puppy grows up, they will need constant training to show them what behavior is correct and incorrect. Start training your puppy as soon as you’re able, and don’t skimp during their younger years. You want to get as much training in before they grow up. Don’t hesitate to hire a professional if you don’t have the time yourself! Balancing proper punishment and praise is an important aspect of puppy training. Ignoring your puppy will always be a better punishment for them that hitting or yelling at them. Make sure to give them praise whenever they chew on their toys instead of you or your belongings. Finding the proper balance between these two training elements will help you train your puppy faster and more effectively. Being consistent in your training will help you get results faster. Make sure to yelp at them every single time that they get their mouth on you. Neglecting their training is a good way to undo your progress and confuse your puppy. Spend time with your puppy often, and keep re-enforcing your training at every opportunity. Do not hit or slap your puppy when they bite you. This will not teach them anything and will only hurt them. Hitting your puppy will also weaken the bond between you two. Only use positive reinforcement, and yelp when they hurt you. Your bond with your puppy should be one of trust, not fear. Hurting your puppy might threaten them and cause more biting issues. Yelling at your puppy will not teach them anything. Simply yelling and then not demonstrating what they did wrong will just confuse them and make it harder to train them out of biting. Training them properly is time consuming and sometimes frustrating, but it’s very important. While crate training will not help them stop biting, it is a good way to ensure that they will not chew on anything while they’re alone. Crate training them is also useful for keeping them out of trouble while you are sleeping. Biting is a common trait in all puppies. With consistent training, you will soon have a properly trained westie puppy. Use proper praise and punishment, and don’t neglect your puppy’s training. Reward your puppy often, especially when they’re being good. If you have frequent issues, consider hiring a professional trainer. Hopefully, this guide will help you with training. If you’ve recently adopted a westie puppy, tell us down below! We’d love to hear your experiences, so be sure to let us know what training methods worked for you. Training a puppy requires diligence and hard work, but it always pays off!